He’s come a long way, baby! Due to all the rain, I rode indoors at night after work. Wizard’s weight is close to perfect, and his coat is glowing. Ahh, the low-maintenance days of summer! I’ll be dreaming of the hosedowns, moonlit barnyards, and blanket-free nights by January for sure. Before our ride, I turned him loose in the arena, and he did a little cantering around. We warmed up on a loose rein, gradually picking up more contact. I tried to be very light with my leg and tried to keep a little more contact with my hands. I tend to let the reins feed out through my fingers- bad habit. I also rode a few laps with no stirrups, something I have not done in a long time. It felt great! 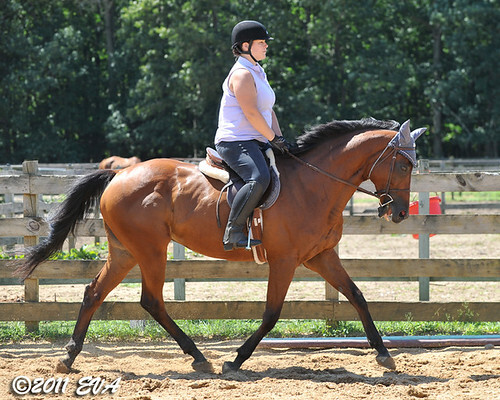 As the trot work continued, I added more shapes and worked on bending and straightening. Trot down the long side, 20 meter circle at E, trot down the diagonal at the end. 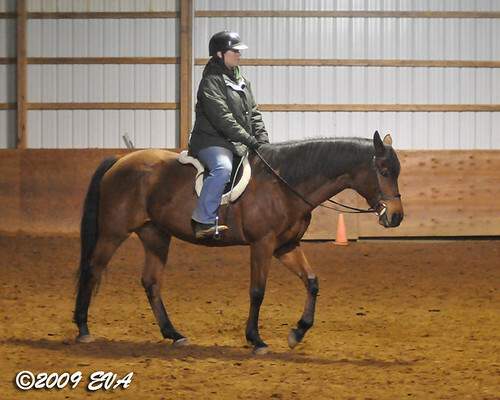 I introduced serpentines, and then worked on transitions within the gaits. Wizard was still swishing his tail and reacting to leg pressure. I have a call in to the chiropractor and she will be seeing him early next week. When we did big-trot-little-trot on the long and short sides, Wizard got tense, and his stride shortened. I worked him back into being relaxed. Once Wizard was warmed up and working, we rode a rudimentary version of the old Training Level Test 1, including the canter work. Wizard’s canter departs were better than they were last time we rode. We had some good moments, plus it was getting late, so I ended on a good note. I keep scrolling back and forth between the photos in awe ❤ The difference is amazing. Thank you! It’s been quite a journey.